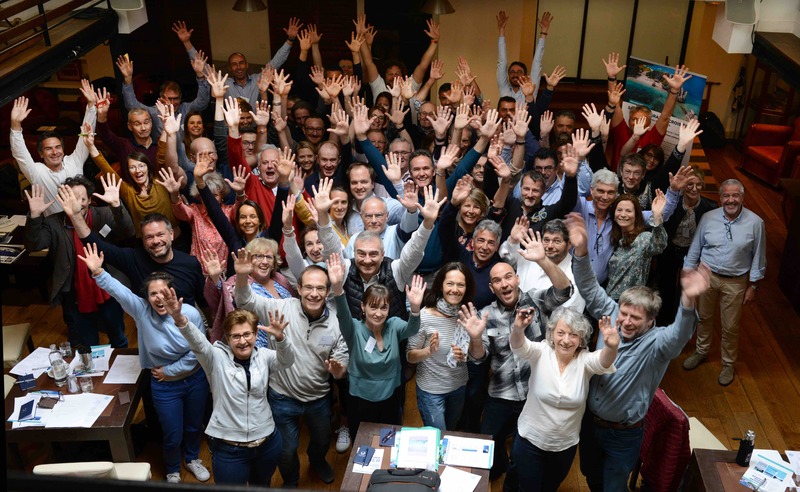 In the four years since I launched this new series of transatlantic rallies, some had started from Lanzarote, Tenerife, La Palma in the Canaries, or from Sao Vicente in the Cape Verde Islands. Some finished in Martinique, others in Grenada or Barbados. Some started in November while others in January. As a result, we now have a fairly good overview of weather conditions for passages to the Caribbean in early or mid-winter. The overall conclusion that I can draw is that every rally seems to have encountered different weather conditions, from consistent trade winds to light winds and long periods of calms. 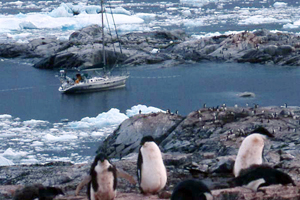 What has become quite obvious is that climate change can no longer be ignored and gone are the days when one could expect consistent trade winds on a winter crossing from the Canaries to the Caribbean. Based on this fact, I decided to present you with a broader picture of your options. Whether joining a rally that starts in November or January, there doesn’t seem to be much difference and the choice would probably depend on your personal factors rather than weather. 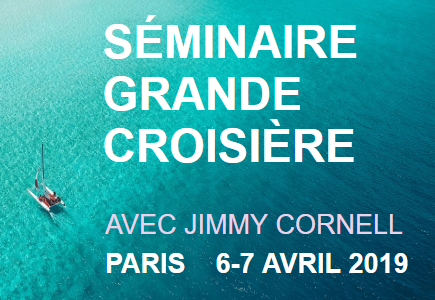 The old strategy of sailing on SSW course on leaving the Canaries and passing 200-300 miles NW of the Cape Verde Islands before altering course for your island of destination seems to be as valid as in the past. The reason why I suggest this cautious route is that in case you need to make an unexpected or unplanned stop in the Cape Verdes, your route is passing close enough to be able to change course and stop there. I wish to stress that such a route is recommended also for those who plan to sail nonstop to Barbados. Whatever route you decide to sail, you may end up using the engine more than you expect if you decide to motor through calm patches or in very light winds. Therefore take as much fuel as you can. The reasons why some participants in each rally stopped in the Cape Verdes were quite varied, but in most cases it was a matter of dealing with breakages, whether of the automatic pilot, engine, steering gear, diesel generator, sails but also personal matters such as health, crew, or because they had motored more than expected between the Canaries and the latitude of the Cape Verde Islands and decided to stop and fill up with fuel before continuing the passage to the Caribbean. 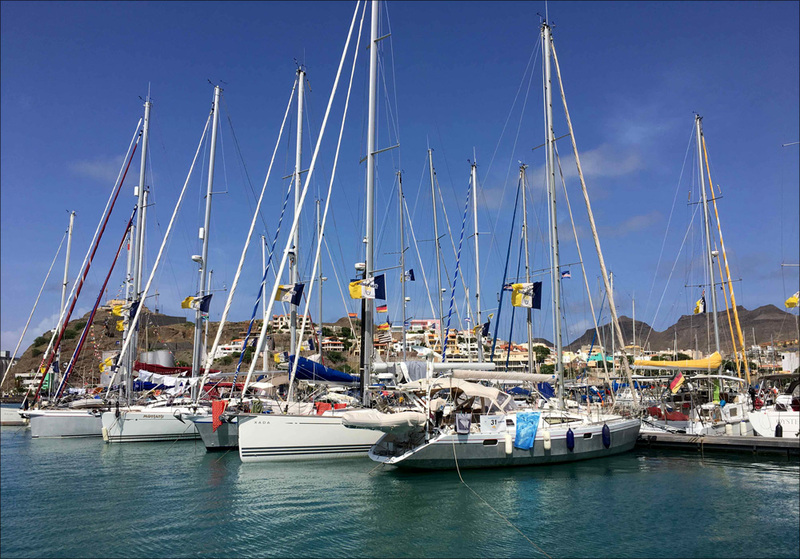 Mindelo marina is well-equipped, with good repair and service facilities so it is definitely the best place to make for in such situations. Mindelo also has the advantage of direct flights to Lisbon with onward connections to many European destinations. But there may be another good reason to stop in the Cape Verde Islands not just in an emergency, the fact that these islands are an interesting cruising ground, still not crowded and offering a variety of attractions. One important matter to stress is that whereas the prevailing winds between the Canary and Cape Verde Islands are NE winds, these are not the regular trade winds, which only occur in lower latitudes. As a result, the first part of a transatlantic passage rarely benefits from consistent winds, which normally are only found in the latitude of the Cape Verde Islands. This is the reason why sailing a course on leaving the Canary Islands that passes close to the Cape Verde Island is a strategy worth considering. In October and November 2016 we had 33 boats in the Barbados 50 Odyssey spend several weeks in the islands and over half of them took part in a cruise that visited several islands. 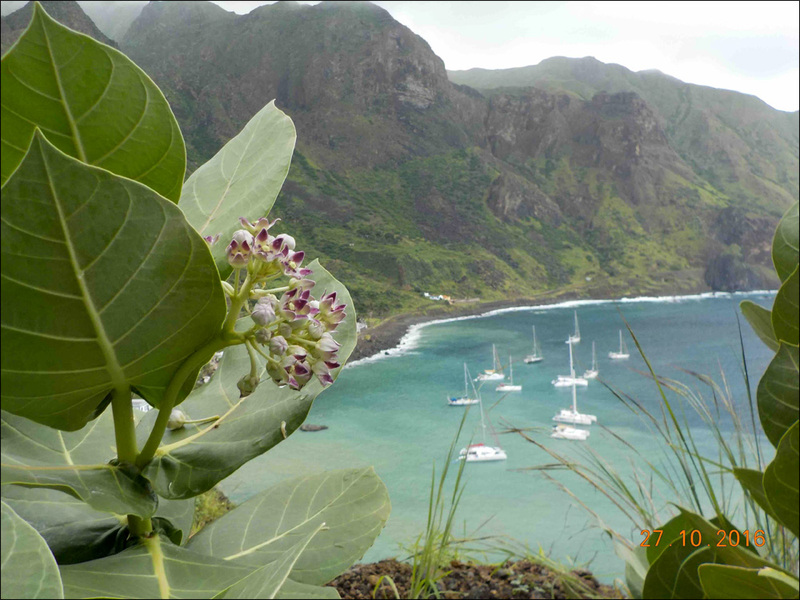 This is the reason why in 2017 we are offering the option of either sailing non-stop from Tenerife to Barbados or break the long passage and include a longer or shorter stop in the Cape Verdes. Those who prefer to spend longer can undertake a shorter or longer cruise, while those who want to stop only for a short time will find Mindelo a perfect place to check your boat’s systems, reprovision and have a rest before embarking on the now considerably shorter crossing to Barbados. The passage from the Canaries to the Cape Verdes is a good test for what works and what doesn’t on a long passage, and in every rally we have several boats being forced to stop to put things right. On the plus side, the onward passage to Barbados normally has a better chance of persistent trade winds because the Cape Verde Islands are in an area with a high percentage of NE winds throughout the year. Barbados has other advantages besides being the closest Caribbean landfall. Its facilities are improving, it has an international airport with frequent flights to both Europe and North America as well as other Caribbean Islands and is therefore a convenient place for crew changes, or for family members to join. But I urge the captains not to allow their crew to book flights that do not allow for a longer crossing time, and also not to buy tickets that cannot be changed in case you are late. Barbados also has a US embassy where those who plan to visit the US can obtain their visas. To find out whether the traditional strategy for a transatlantic passage from the Canaries is justified I looked at the passage times recorded in some recent rallies and compared the duration of direct, nonstop passages from the Canary Islands to Barbados with those that made a detour to Mindelo and stopped for a few days before resuming their transatlantic passage. The average nonstop transatlantic passage of 2700 miles was 22 days, from the fastest of 19 days to the slowest of 25 days. Looking at the figures for the passages that included a detour, the average passage time from the Canaries to Mindelo (830 miles) was 7 days, from the fastest of 5 days to the slowest of 9 days. The average time of passages from Mindelo to Barbados (2020 miles) was 15 days, from the fastest at 11 days to the slowest of 17 days. One boat took 23 days to arrive in Barbados as its engine had broken down shortly after leaving Mindelo and the crew had to sail all the way being slowed down by light winds. 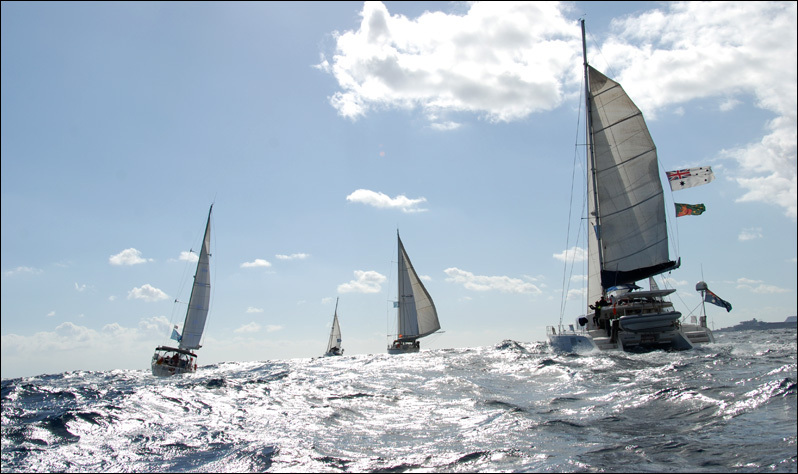 An average time of 22 days on a direct passage of 2700 miles from Tenerife to Barbados at an average speed of 4.9 knots. 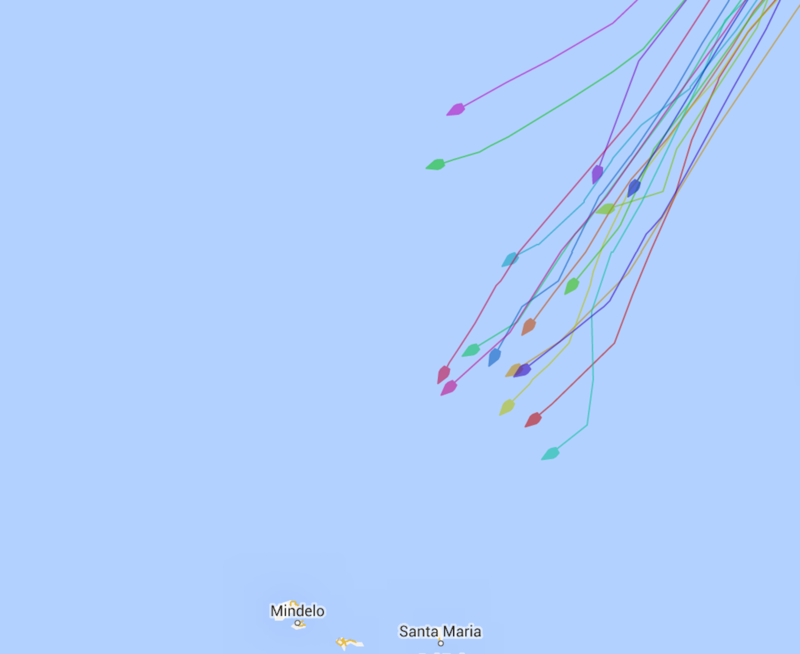 An average time of 7 days on the 830 miles passage from Tenerife to Mindelo at an average speed of 4.9 knots. 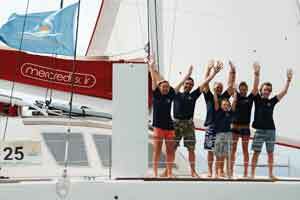 An average time of 16 days on the 2020 miles passage from Mindelo to Barbados at an average speed of 5.3 knots. Assuming that an average three days are spent in Mindelo, the total time adds up 25 days, only three days longer than the nonstop passage. To illustrate some of the above points, I include the tracking diagrams of recent rallies as shown on the tracking map on our website. Based on the above figures, I believe that allowing for a possible stop in the Cape Verdes would be justified, whether such a stop is dictated by external factors, or taken as a deliberate decision to break the long passage into two shorter and thus more manageable sections. 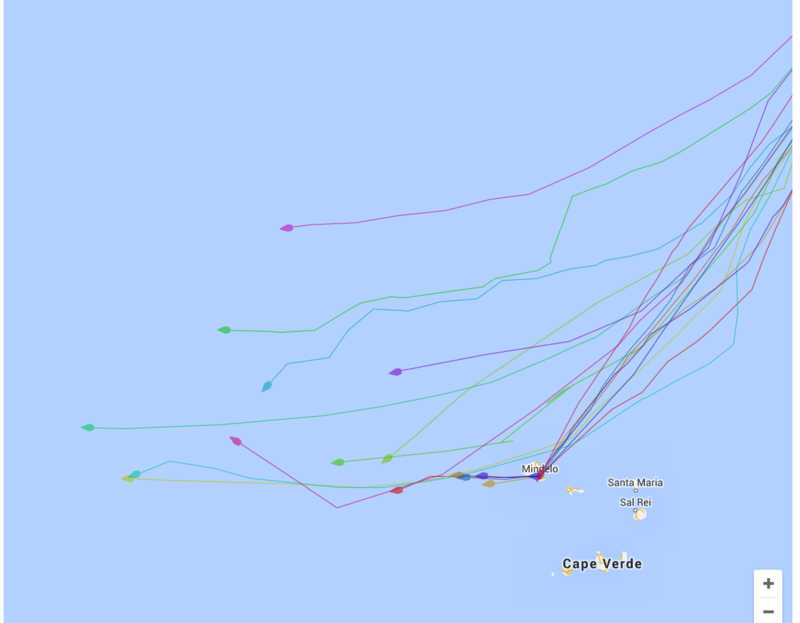 Day 5 after the start from Tenerife, most boats play it safe and sail a course that will pass close enough to the Cape Verdes if the decision is made to stop. Day 9 and some boats have stopped in Mindelo and resumed their passage after a few days, some decided not to stop and set a direct course for Barbados, and some are so far north that they missed both the option of stopping in Mindelo and the advantage of better winds on a southern route. Day 16:Getting closer to Barbados but those that had sailed the northern route were not necessarily the fastest, although they had used their engines more than the others, while those that had stopped at Mindelo are gradually catching up. Day 20: the fastest boats have arrived or are close to finishing. 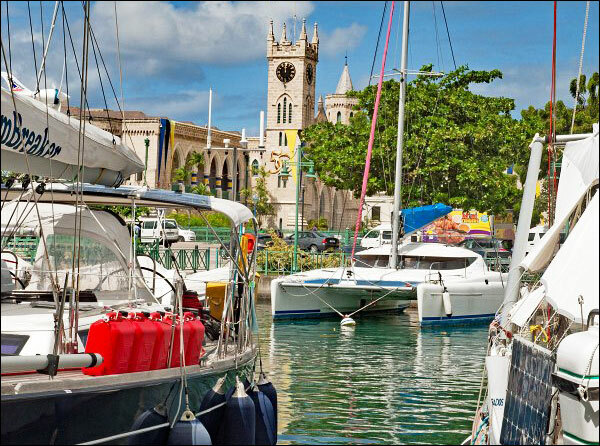 Day 28: with one exception, all boats that had stopped longer in Mindelo have finally arrived in Barbados. 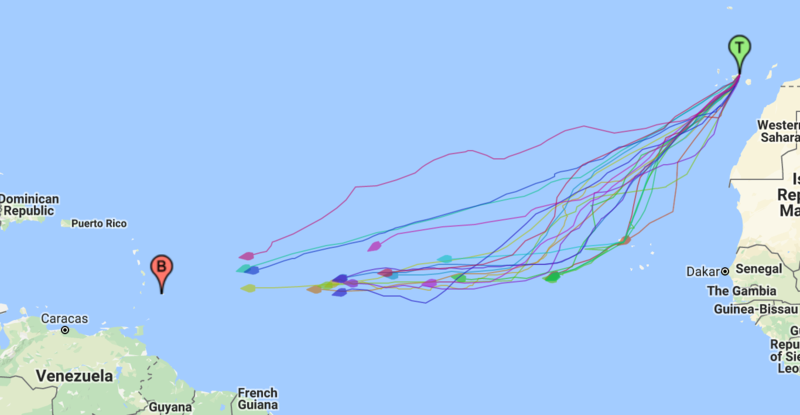 Barbados 50 November 2016 day 18: route track shows the advantage of undertaking the transatlantic passage in an area where the percentage of consistent winds is higher. With three exceptions (longer stays in Mindelo or broken engine), 30 of the 33 boats had arrived in Barbados.